We've already heard a lot of exciting details about this popular upcoming football simulator, but haven't seen any exact gameplay footage yet. The developers decided to correct this disappointing misunderstanding, so they published first FIFA 14 trailer a few minutes ago. 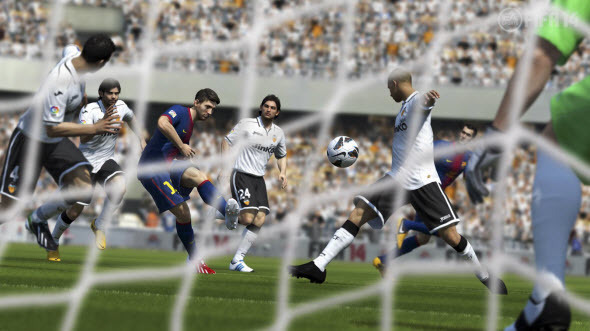 In gameplay FIFA 14 trailer you will be able to see several newest game's functions in action. As always, the developers are trying to make this simulator as close to the reality as possible. According to FIFA 14 trailer, now you will be able to choose your position to make the perfect pure shot. Also the protection of the ball will become much more natural. Thus, in FIFA 14 trailer we can see the upgraded dribbling system and the ability to dictate the tempo of dribbling. Two last but not least features that are shown in FIFA 14 trailer touch the realistic physics and updated teammate intelligence. Well, in video these functions look very cool, but whether they are really so good, we will find out only after FIFA 14 release date that is scheduled for the 27th of September.